Saks Fifth Avenue and W magazine hosted an all-day skin care and beauty event. I took time out of my busy schedule and work day yesterday afternoon to enjoy a complimentary mini facial from SK-II, makeup touch-up from Dolce & Gabbana and hair styling by Frederic Fekkai. 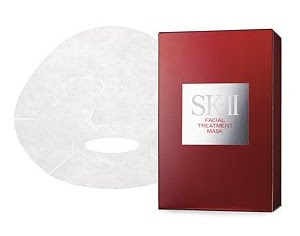 This was my first introduction to SK-II skin care and I was really impressed by the facial treatment mask, which immediately left my skin radiant as if I just had a full facial at a spa. The facial treatment mask is available in packs of 6 ($90) or 10 ($125). The radiance and moisture boosting mask is perfect for travel and the ultimate facial-on-the-go. It is naturally cooling but can be refrigerated for a more intense cooling effect. The mask only needs to be left on for about 7 minutes and applied once a week. The facial treatment essence ($195), essential power cream ($205) and skin signature eye cream ($110) were also used during my customized facial, which addressed my anti-aging and hydration concerns. Thank you to Raymonde for a luxurious facial treatment! Please be sure to visit her at SK-II at Saks Fifth Avenue! After my SK-II facial, I headed over to the Dolce & Gabbana counter for a gorgeous makeover. Here's a look at the Dolce & Gabbana products Michelle used, including the classic cream lipstick in Dramatic, ultra-shine lip gloss in Gold and volumized lashes mascara in Dahlia (I couldn't leave without getting this). Thanks Michelle! If you need anything from Dolce & Gabbana beauty, go visit her! For my last stop, I headed over to the Frederic Fekkai counter to get my hair curled and styled. Jordi used the Silky Straight Ironless Smooth Finish Serum and Sheer Hold Hairspray. If you need a stylist, I definitely recommend visiting Jordi at the Soho Frederic Fekkai Salon. Thanks Jordi! Also a big thank you to Social Diva for the invitation!